I've always wanted to can, but for some reason, Im afraid Im going to screw something up and waste a whole years harvest of tomatoes. I dont know why I have the fear of screwing it up. I was tempted to practice over the winter, on some store bought stuff. Sure, its not the freshest or in season, but it would allow me to build up some confidence before I try it on my own. Tomatoes/ puree would be the main reason for me to can. Other than tomatoes and peppers, everything else i just grow enough for the season, and the pickles I eat faster than i pickle. When I first started canning, I just did a couple of jars of something in a hot water bath. I used a large pot and put a grate in the bottom of pot. I followed the instructions in Joy of Cooking. It was pint jars, because bigger jars wouldn't have fit. Also, if it hadn't worked, I could just put the two jars in the fridge. And if it had gone really wrong, I wouldn't have wasted much. The only special equipment I needed was the canning jars and lids. Start small and see how it goes. I did move up to a proper hot water canner and eventually to a Presto pressure canner. You can do it Larry. Let's see, what's important when you can tomatoes? 1. Wash the jars, then sanitize them--in boiling water, or a hot dishwasher. 2. The lids, either put them in hot water or boil them, just read the package and it tells you what to do to prepare them. 3. The tomatoes--follow a recipe from a university extension office/website or the National Canning blau blau website. 4. Once the sauce/juice is made, put lemon juice or citric acid or vinegar, and salt, into the jars (pints or quarts). It's in the recipe. 5. Put the sauce/juice in allowing for the correct amount of head space. It's in the recipe. 6. Wipe the tops of the jars with a paper towel with a little vinegar on it, then put the lid and ring on it. 7. In a large kettle, make sure your water is at a similar temperature to the jars of tomatoes, put the jars in. The water needs to be over the jars. 8. Bring to a boil, boil the prescribed amount of time required in the recipe (20 minutes, 30 minutes, whatever). It's in the recipe. 9. Remove to a counter with a towel on it, and let cool. Check the lids after cooling to make sure they have sealed (became concave). They make a pinging noise when they go concave. 10. Remove the rings for storage. There, in less than one trillion steps you can can tomatoes. 99% of the time, if your lid is concave, it is sealed. Then it won't be ruined. If it becomes unsealed, it will fall off once you remove the rings. Thanks Taxlady. I put up 100 qts of tomatoes this summer, and I stored them without rings, with tattler lids. (which was quite an experience because it was different from metal lids) Now I'm waiting for that 1% failed lid seal--so far, so good. Trying new things can be nerve racking. The metal lids have an epoxy of some type on them, can be used once. The tattlers are rubber/plastic lids with a separate gasket, and they can be used over and over again, and they are more expensive. 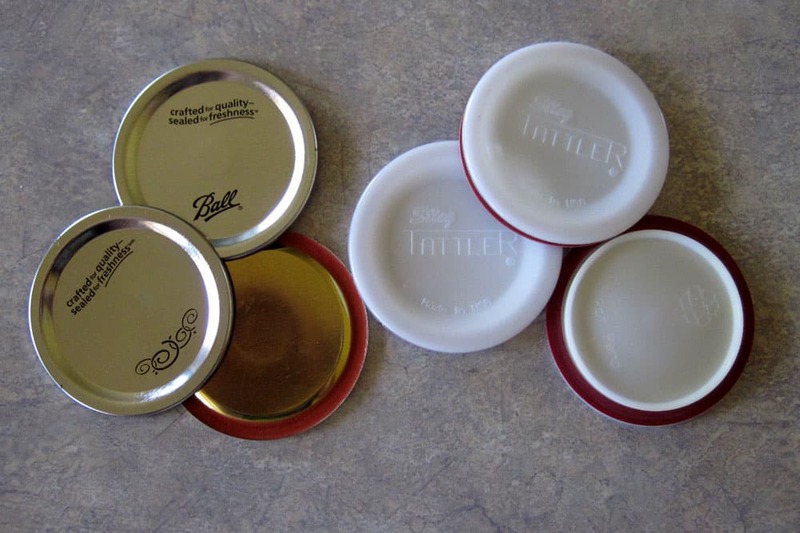 There is a different method used when applying the tattler lids compared to the regular metal lids. Cool! I imagine the tattlers work out cheaper in the long run. Also, less waste on a planet drowning in waste. I assume they are BPA free? Ill make it one of my New Years resolutions. My goal is to perfect it and feel comfortable with it before next season. Speaking of which, I got my first Garden Catalogue already. Usually I start getting them in December.